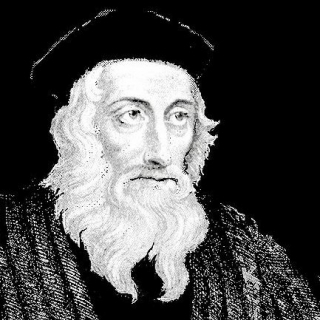 John Wycliffe, first of the famous reformers, lived from about 1320 to 1384—a period of many hardships. The Hundred Years’ War, the Black Death, the Peasants’ Revolt, and the captivity of the church at Avignon, France all happened in his lifetime. Wycliffe was born to a devout Catholic family in northern England. He attended Oxford University, receiving a degree of Doctor of Theology and becoming Professor of Theology. He was known as “the gospel doctor” because of his zeal for the Bible. He was chaplain to the King, and an adviser to Parliament. He created two translations of the Bible, which some say did more to free England than any war did. His writing style was very intricate, but never funny. In character he was serious and reasonable. He never seemed to be in good health and often looked gaunt or ill, but was hospitable, pleasant, energetic and had a strong will. He lived a life deeply devoted to the Word of God. .
Wycliffe’s entry into politics began with a clash against the Catholic Church. They asked England to pay the Papacy money owed in taxes since King John had first recognized the Pope as overlord of England. Wycliffe disagreed, and persuaded Parliament against the Papacy. Wycliffe won both friends and enemies. Soon after, Wycliffe proposed a ban on the export of metals to Rome. He also proposed that the Catholic Church should hold a lower position below the government. Wycliffe believed that the Pope’s rule over any nation was unBiblical. He also believed that the evils in the Church came from wealth and power. He claimed true religion is dependent on one’s relationship with God without priestly interference. He maintained that the transforming of the bread and wine of the eucharist into the body and blood of Christ was a heresy. He also refused to accept the veneration of saints, relics and pilgrimages. As Wycliffe’s opposition to the Church began to have an effect on the people, the Papacy tried to silence him. Wycliffe held high standing in politics and society, which made it hard for the Papacy to stop him. John Wycliffe was taken to trial twice. But since he was still held in high esteem, there was no major effect. Under pressure, Oxford University expelled Wycliffe in 1382. On December 28, 1384, Wycliffe was attacked with paralysis. He died on New Years Eve of that same year. The Papacy was unable to excommunicate Wycliffe as a heretic when he was alive. However, in 1415, the Council of Constance ordered that Wycliffe’s body be dug up and burned. This was finally done in 1428, and his ashes were scattered in the Swift river. Wycliffe’s legacy is one of influence and prestige. He was one of the most important religious figures in England. Two of his greatest works were to provide inspiration for a religious revival, and the writing of the first English translation of the Bible.